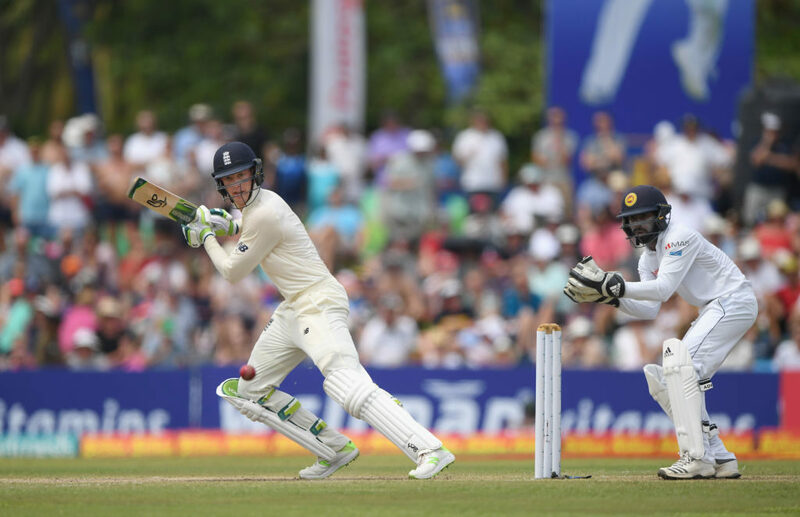 South African-born Keaton Jennings scored 146 not out on the third day of the first Test against Sri Lanka in Galle to allow England to declare on 322-6 and set Sri Lanka 462 to win in two full days. Jennings and debutant Rory Burns resumed England’s second innings on 38 without loss, Burns scoring 23 off 65 balls before being run out by Dimuth Karunaratne with the score on 60. Moeen Ali and captain Joe Root each fell after scoring just three runs, which brought Ben Stokes and Jennings together. The two left-handers added 107 for the fourth wicket, Stokes contributing 62 off 93 balls before playing down the wrong line to be bowled by Dilruwan Perera. Jos Buttler (35 off 58 balls) and Jennings added 77 together in just under an hour, followed by a bristling 61 with debutant (and first-innings centurion) Ben Foakes in just over half an hour. Foakes scored 37 off 34 balls before holing out to deep square leg. Root declared two balls later, leaving Jennings undefeated on 146 off 280 balls, having hit just nine fours in his highest Test score, and his first not out. It was also his first Test century for almost two years and was just reward for his resilience in fighting through a tough series against India. His two centuries have come in his first and last Test innings and make up 38% of his total Test runs (258/678), coming off 33% of the balls he has faced in Test cricket (499/1,480). Perera ended with figures of 2-94, while Rangana Herath signed off from Test cricket by taking 2-59, leaving him on 433 Test wickets, one behind legendary Indian opener Kapil Dev, and tied for eighth place on the all-time list with England’s Stuart Broad. Sri Lanka finished on 15 without loss off seven overs, leaving them the choice of batting out two days for the draw, or knocking off 447 more runs for the win with 10 wickets in hand.